You’ve heard it said, “It’s not about the destination, it’s the journey.” Truth be told, with RVing, it’s both. To enjoy either of those, you need to be able to find an accommodating campsite for your tent, trailer, fifth wheel, or motorhome. Whether it’s a quick overnight stop on your way to a National Park, the park itself, or an elaborate full-featured RV resort, the RV LIFE app will help you get there. For over a decade, savvy RV veterans have used Campground Reviews as the definitive source for accurate campground reviews by actual campers. Now, RV LIFE brings the depth of that exclusive database to your mobile device within the RV LIFE app. Unlike other review sources, real RV and camping enthusiasts contribute detailed reviews and photos of campgrounds and park locations they have visited. Over 200,000 unbiased experiences of these travelers are now at your fingertips within the RV LIFE mobile app. Choosing a great campground starts with the excellent filtering capability built into the RV LIFE app. Tap the Filters button at the top of the map and start narrowing down your campground search. You’ll want to subscribe to the RV LIFE app to enable the Premium filters such as Park Types and Affiliations. Work your way down the list and check those features you can’t live without. Whether you choose pets, pools, and pull-throughs or water and Wi-Fi, there is a filter for you. Perhaps you’ll choose to skip the niceties and select the BLM locations and go off-the-grid. The RV LIFE app lets you do it all. Now that your choices are more refined you can review the sites that interest you. Tapping a green camper icon on the map reveals a banner at the bottom of the screen with the name of the campground, distance from your current location, and its Campground Reviews rating. Tap the banner for a detailed review of the campground, photos, maps, directions and much more. You can even switch to satellite view on the map and zoom in for a closer look to check for ease of access, or get a bird’s-eye view of the park or campground. Tens of thousands of campers have taken the time to pass on information and opinions of the campgrounds you are interested in. Along with reviews and photos, many reviewers offer sage advice in the Tips for Campers section. Notes about hosts, the roads, local attractions, and eateries are all found here. You can even use the Questions and Answers feature to find additional information. Tap the Ask a Question button and an anonymous request will go out to others that have stayed in the campground that might be able to provide the answer. When you return from your trip, take a few minutes to reminisce and open the RV LIFE app on your mobile device and share your valuable opinions about the campgrounds you visited. While you’re at it, save the campgrounds you enjoyed the most by tapping the Favorite button. Those favorites will then be identified by a heart icon on the map and listed in the Account section in the RV LIFE app. With RV LIFE, you become a part of the RVing community. 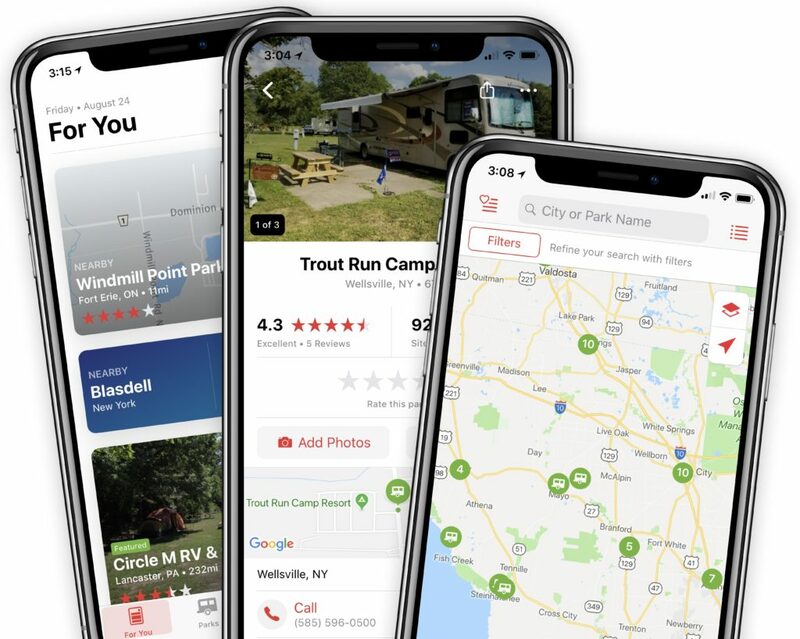 The Campground Reviews integration in the RV LIFE mobile app ensures that you can have the easiest, most comprehensive way to find, review, stay, and contribute.